What’s your favorite comfort food? Well, my favorite comfort food is tater tot casserole. 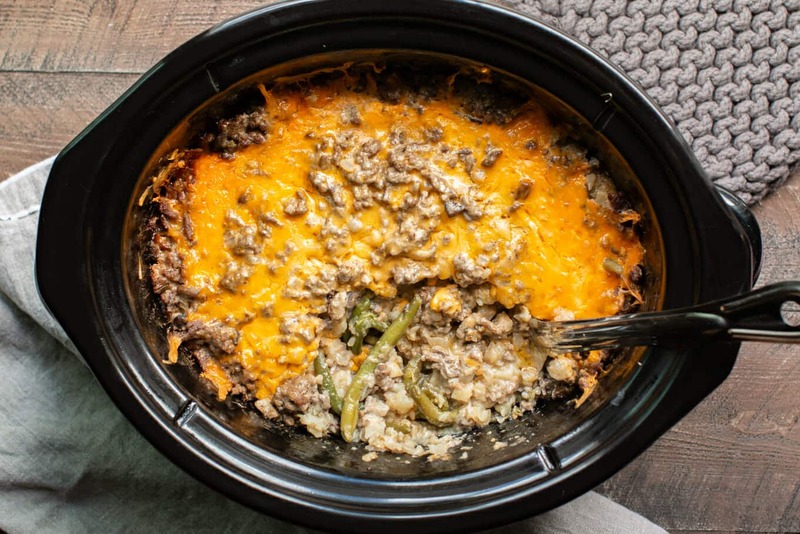 Yeah, this casserole isn’t the most glamorous meal you can make, but it’s sure delicious! To make this tater tot casserole, I start by browning hamburger in a skillet with diced onion, season with salt and pepper, add 2 cans of cream of mushroom soup, a little milk. 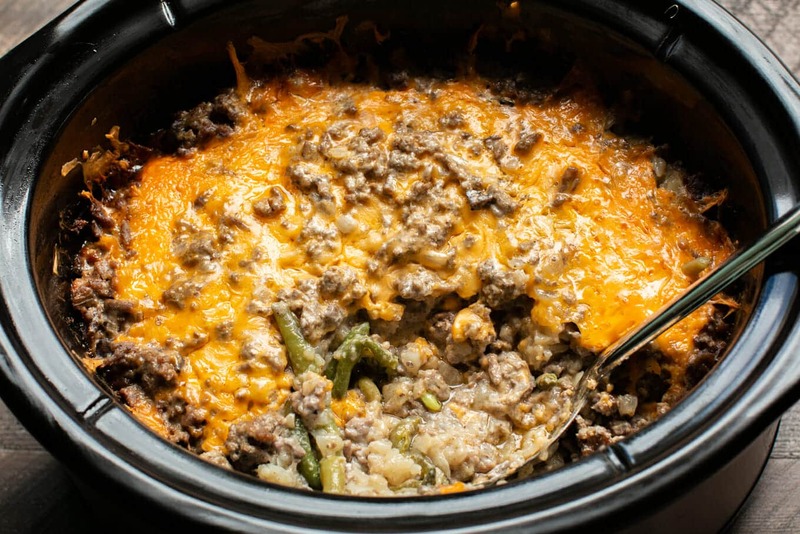 Then I layer the tots and green beans in the slow cooker and pour over the ground beef mixture and top with cheese. Cover and cook on low for 5 hours and dinner is ready! Below is my YouTube video on how to make this Slow Cooker Tater Tot Casserole. You can follow me on YouTube, here. 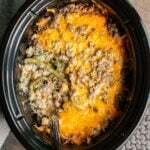 In a large skillet set over medium high heat add the ground beef and onion. Cook until the beef is brown. Drain fat. Add the cream of mushroom soup and milk to the pan with the beef. Add salt and pepper to taste. Stir. Add half of the tater tots to the slow cooker, spread them out to an even layer. Add the green beans next. Then the rest of the tater tots. Pour over the beef mixture. Spinkle over the cheese. Cover and cook on LOW for 5 hours without opening the lid during the cooking time. Serve and enjoy! Nutritional values are approximate. If you require a special diet, please use your own calculations. The values below are for 1/8 of the recipe. My family is picky and doesn’t like mushrooms or green beans. I fried 1 lb hamburger, mixed with 2 cans creamed corn, then poured over 4 cups tater tots. 4 hours later (on low) it was amazing. Serves 3-4 people. I didn’t add any cheeses or milk. Kim- That is such a great idea, dairy and gluten free! Did you not add any soups either? I cannot stomach tater tots so cut up potatoes into cubes and used Vegan Meat Crumbles for the ground beef and it turned out amazing too. I love tater tots! This is a rocking recipe! I think it’d be great at a potluck or even for a brunch. Thanks! 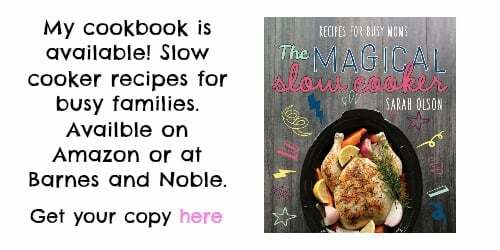 This sounds so good!I never thought to make it in the slow cooker! 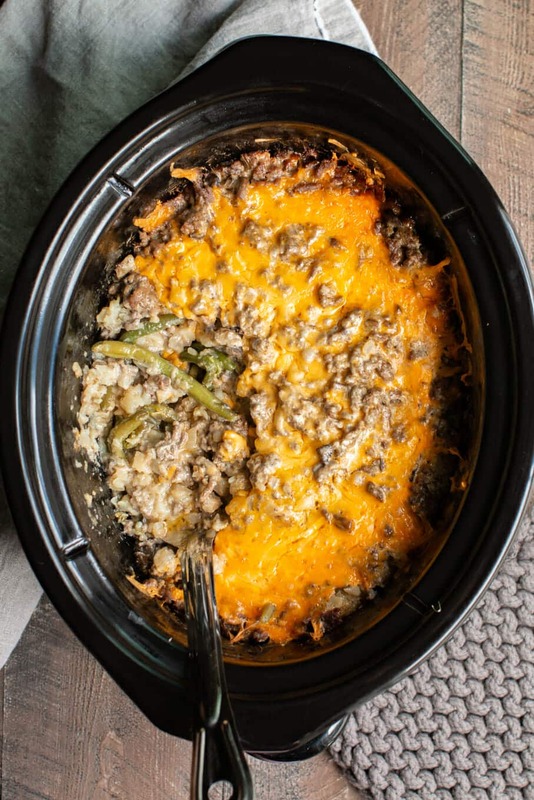 I’ve heard of tater tot casserole, but in the slow cooker I will have to try! My husband was just asking me to make this the other day! 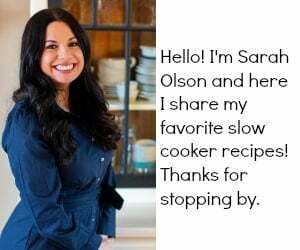 Now I have a great recipe to make – thank you, looks and sounds delish! I just put all of the mixture in the Crock Pot. It only took me 30 minutes! Awesome! And it looks amazing! Thanks for a great recipe! I grew up on this stuff and cook it regularly. I do it all different though. I use cream of mushroom soup and cream of celery mixed with the browned hamburger. Put all that in a casserole dish and top with a solid layer of tater tots. place in oven on 350 degrees for about 30mins or until the tater tots are golden brown then take out of oven, spread out a layer of shredded cheddar cheese and place back in oven. Let it cook until the cheese is melted then it’s ready to eat!! Do you drain your beef after browning? Or is the extra grease needed for the recipe, I would drain normally. I would drain James! Great question! 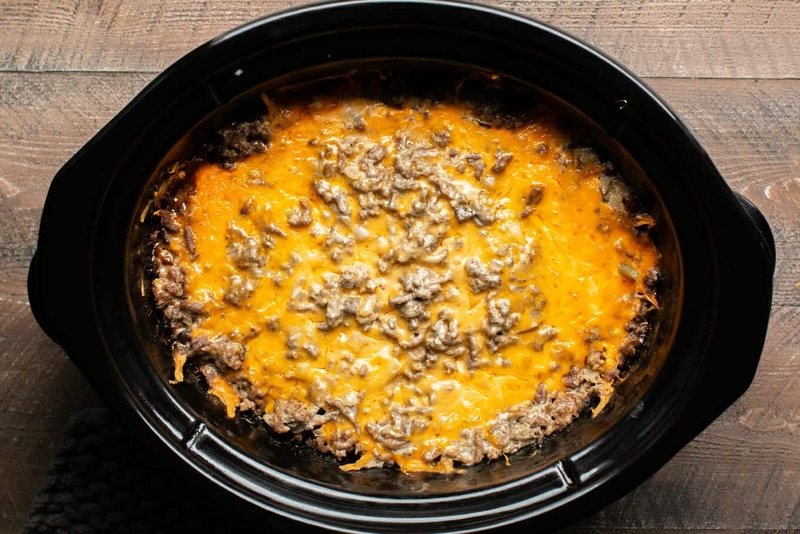 I mix rotel tomatoes & green chili and Cambell’s Fiesta Nacho Cheese Soup with the meat and pour it over cooked tator tots in a cake pan and put it in the oven with shredded cheese on top. My family LOVES it. You can fry the tator tots or cook them in the oven. The crock pot idea would work too. I made this for a Packer game and it was a total hit !! Added extra cheese of course. 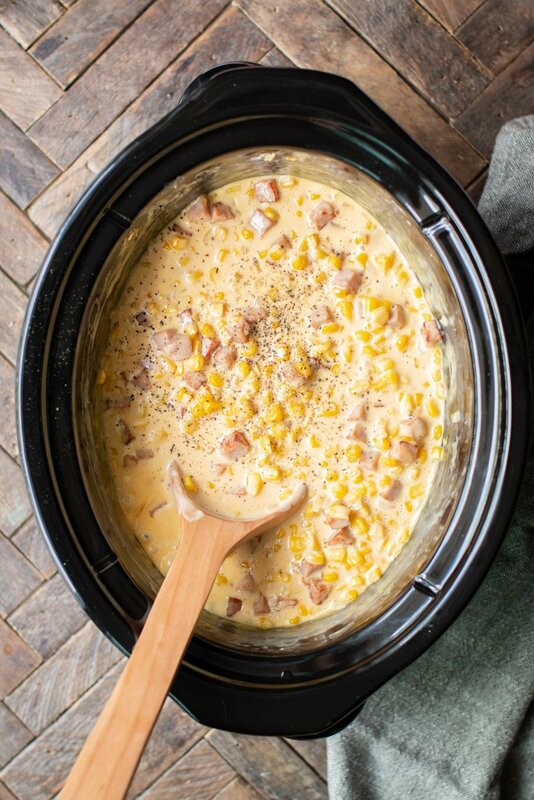 Why not use 2 cans of cheese soup and avoid the need for a cheese topping? Someone brought this to us after I’d had a baby and it was delicious! Do you drain the canned green beans? are the tots supposed to get crunchy? no, they turn into a casserole, I think they taste good. I like my tots crunchy so I bake them in the oven and add top them onto my casserole on my plate. I think they will work fine! Most wonderful, tasty comfort food. 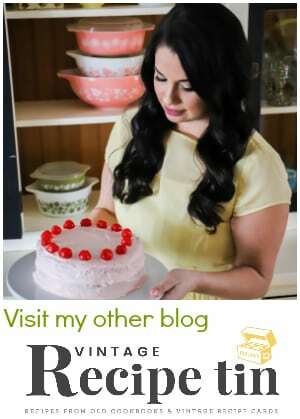 My wife and I devoured it – thank you Sarah for the recipe! I like to add hash browns with cream of cheese soups. I have a family member who doesnt like mushrooms. I dont add the veggies i cook those as a side. Yes, I think it would work fine! Do you thaw the tater tots, or leave them frozen? 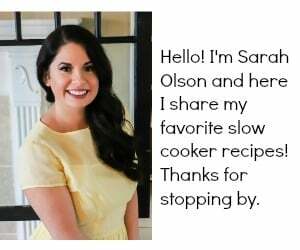 Can I use a 4 quart crock pot that’s all I have? If it’s fits it should be fine. I have it in the crockpot now. So delicious!